The U.S. Congress is among the most maligned institutions in the country. In July of this year, it registered an 11 percent approval rate—below banks, television news, and health insurance companies—and decrying partisan gridlock has all but displaced baseball as the national pastime. Yet while the perils of this institutional failure are obvious for domestic policy, their consequences for foreign policy are under-explored. The Constitution delegates to Congress considerable responsibility for foreign affairs, including the right to declare war, fund the military, regulate international commerce, and approve treaties. At least as important are such congressional authorities as the ability to convene hearings that provide oversight of foreign policy. A failure to perform these functions could have significant results, leaving the United States hobbled by indecision and unable to lead on critical global issues. 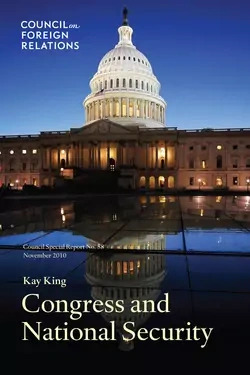 In this Council Special Report, Kay King, CFR's vice president for Washington initiatives, explores the political and institutional changes that have contributed to congressional gridlock and examines their consequences for foreign policy making. Some of these developments, she notes, are national trends that have developed over a number of decades. Successive redistricting efforts, for example, have all but eliminated interparty competition in some House districts, leaving the real competition to the primaries and the most ideologically driven voters. King further notes that the rising cost of elections has increased the time devoted to fundraising at the expense of substantive priorities, and the twenty-four-hour news cycle has decreased the time and incentive for reflective debate. More subtle—but equally important—institutional changes have likewise diminished Congress's effectiveness. A decline in committee chairmen's authority and expertise, tighter control over voting by party leaders, and the relaxation of traditional customs limiting the use of procedural tools to practical ends have all, she writes, led to a breakdown in comity. The consequences she highlights are both broad and significant, from delayed presidential appointments to a poorly coordinated budget process for critical foreign policy areas such as intelligence, diplomacy, and development. Solving these well-entrenched problems will likely prove impossible, but King issues a number of recommendations that can make a difference. Congress, she writes, should restore traditional restraint in procedural maneuvering, rationalize the budget process, and revamp committee structure in both houses to better address the fast-moving, interrelated threats the United States faces today. The Executive Branch should improve its coordination and consultation with Congress, while, she concludes, the public should hold Congress accountable by becoming better informed on international issues. As the 112th Congress takes shape during the coming months, Congress and National Security will provide sensible guidance to party leaders interested in establishing a more constructive foreign policymaking process. As the complexity and interconnectedness of the world's problems grow, there can be little doubt that such reforms are both timely and desirable.